The AliveCor Heart Monitor device is an iPhone case that provides ECG recording as you hold your device. The recent update to the AliveECG app provides cleaner ECG recordings. The addition of the enhanced filter reduces the background noise to deliver a clear signal and ECG recording for better discrimination and interpretation. Even if experiencing mild tremors, a clear recording can be achieved. 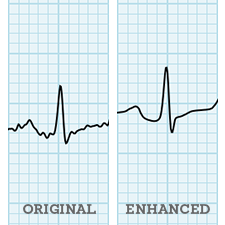 It is now easier than ever to annotate your ECG reading with your symptoms and activities. Once the ECG recording is complete, the annotation screen automatically pops up. Just tap on the symptoms and/or activities or exit from the screen. Annotation can be important for you and your physician to recognize patterns and potential triggers affecting your ECG results.